Curveballs curve and fastballs go really fast, but new research suggests that no pitcher can make a curveball "break" or a fastball "rise." Led by Arthur Shapiro of American University and Zhong-Lin Lu of the University of Southern California, the researchers explain the illusion of the curveball's break in a publicly available study in the journal PLoS ONE. The study comes a year after the same group won the prize for best illusion at the Vision Sciences annual meeting with a demonstration of how an object falling in a straight line can seem to change direction. That demonstration led to debates among baseball fans over the existence of the break in curveballs, breaking balls and sliders. There is no debate in the researchers' minds. A little terminology: to many batters and pitchers, a break is a deviation from the relatively straight path of a fastball. In that sense, all curveballs break. The authors of the study use the term to describe an apparent sudden drop or other change in trajectory as the ball nears home plate. That, they say, is an illusion. The PLoS ONE study explains the illusion and relates the perceived size of the break to the shifting of the batter's eye between central and peripheral vision. "If the batter takes his eye off the ball by 10 degrees, the size of the break is about one foot," Lu said. He explained that batters tend to switch from central to peripheral vision when the ball is about 20 feet away, or two-thirds of the way to home plate. The eye's peripheral vision lacks the ability to separate the motions of the spinning ball, Lu said. In particular, it gets confused by the combination of the ball's velocity and spin. The result is a gap between the ball's trajectory and the path as perceived by the batter. The gap is small when the batter switches to peripheral vision, but gets larger as the ball travels the last 20 feet to home plate. As the ball arrives at the plate, the batter switches back to central vision and sees it in a different spot than expected. That perception of an abrupt change is the "break" in the curveball that frustrates batters. "Depending on how much and when the batter's eyes shift while tracking the ball, you can actually get a sizable break," Lu said. "The difference between central and peripheral vision is key to understanding the break of the curveball." A similar illusion explains the "rising fastball," Lu added. The obvious remedy for a batter, repeated by parents and coaches everywhere, is to "keep your eye on the ball." That is easier said than done, according to the authors. As the ball nears home plate, its size in the batter's field of view spills out of the eye's central vision. "Our central vision is very small," Shapiro said. "It's the size of the tip of your thumb at arm's length. When an object falls outside of that region, strange perceptions can occur." Lu noted that the spin of the ball tends to draw the eye to the side, making it even harder for the batter to keep the ball in central vision. "People's eyes have a natural tendency to follow motion," Lu explained. His advice to hitters: "Don't trust your eyes. Know the limitations of your visual system. This is something that can be trained, probably." Lu, Shapiro and their co-authors plan to build a physical device to test the curveball illusion. Their study was carried out with volunteers tracking the movement of a disk on a computer monitor. To the authors' knowledge, the PLoS ONE study represents the first attempt to explain the break in the curveball purely as a visual illusion. Others have tried to explain the break as a result of the hitter overestimating the speed of a pitch. Responding to comments from baseball fans, Lu agreed that on television, pitches filmed from behind home plate appear to break. He called it a "geometric illusion" based on the fact that for the first part of a pitch, the viewer sees little or no vertical drop. The ball is falling at the same rate throughout the pitch, Lu said, but because the pitcher tosses the ball at a slight upward angle, the first part of the pitch appears more or less flat. As a result, the drop of the ball near home plate surprises the eye. For Shapiro and Lu, who have studied visual perception for many years, the PLoS ONE results go beyond baseball. "Humans constantly shift objects between central and peripheral vision and may encounter effects like the curveball's break regularly," the authors wrote. "Peripheral vision's inability to separate different visual signals may have far-reaching implications in understanding human visual perception and functional vision in daily life." The animal in question is the rock hyrax, a common species in countries such as Namibia and Botswana. They look like large guinea pigs but are actually related to the elephant. Hyraxes use specific locations as communal toilets, some of which have been used by generations of animals for thousands of years. The urine crystallises and builds up in stratified accumulations known as 'middens', providing a previously untapped resource for studying long-term climate change. Funding from the Leverhulme Trust and, more recently, the European Research Council has allowed the Leicester group to join an international team led by Dr Brian Chase, from the Institut des Sciences de l'Evolution de Montpellier, to study these unique deposits. With Dr Chase, Drs Andrew Carr and Arnoud Boom from the University of Leicester's Department of Geography are engaged in exploring novel records of past environmental change preserved within the middens. Their work has recently been published in the journals "Quaternary Research", "Palaeogeography Palaeoclimatology Palaeoecology" and "Geology". "In order to study past environmental changes scientists typically acquire samples from deposits laid down in bogs or lakes, within which organic matter, which can be dated is preserved," explains Dr Carr. "But in dryland environments such as southern Africa this isn't possible. Fortunately it seems that hyrax urine preserves organic matter over timescales of tens of thousands of years, which provides remarkable insights into past environmental changes within the hyrax habitat." Obtaining the material is not easy and Dr Chase is an experienced rock-climber, which allows him to reach middens that are often otherwise inaccessible. 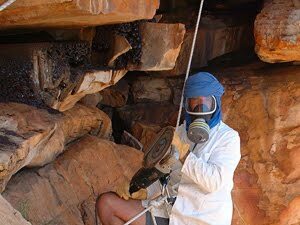 The middens form extremely tough deposits, which have to then be cut from the rocks with an angle grinder. Using forensic techniques the Leicester group has been able to identify the individual organic molecules preserved in the middens; these include compounds produced by the hyraxes' metabolism and plant-derived molecules which passed through the animals' digestive system. These 'biomarkers' provide clues as to the kind of plants the animals were eating and therefore the sort of environment they were living in. The biomarkers thus reveal insights into how the climate of the region has changed during the last 30,000 years, with a potential accuracy of a few decades to centuries. "Palaeoenvironmental records in this area were fragmentary," says Dr Carr. "The middens are providing unique terrestrial records to compare against nearby deep ocean-core records, allowing us to think in much more detail about what drives African climate change. "This is a very dynamic environment, and it appears that that the region's climate changed in a complex manner during and after the last global Ice Age (around 20,000 years ago). The next step, which is part of Dr Chase's new research project, will be to compare the midden data against simulations of past climates generated by GCMs [computer-based general circulation models that are used to simulate both past and future climates] to evaluate their performance and explore why climates have changed the way they have." Although the rock hyrax middens have been previously used to study pollen, this is the first time that their full potential to document the region's climate has been explored. Drs Chase, Carr, Boom and their colleagues have already a number of scientific papers on hyrax urine, with more in production.